Join us to celebrate 5 years of Cocktails, Entertainment and Casual Elegance! 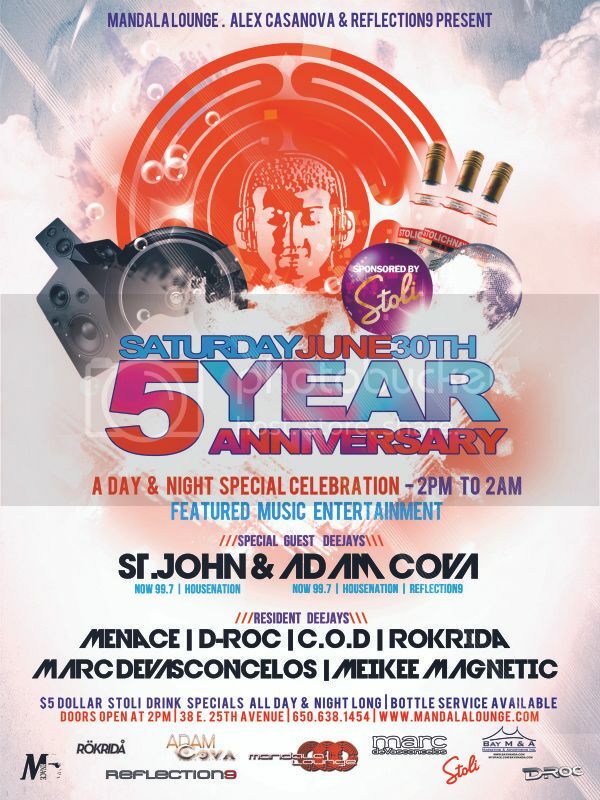 Greg Hawkins, Alex Casanova and Moy of Reflection9 have put together a Day & Night Exclusive Event, Sponsored by Stoli Vodka. We invite all supporters, friends, industry affiliates and family to be a part of the soiree under the Sun and Stars. Mandala Lounge will be re-staged to display the amazing talent of our resident deejays along with Special Featured Guest Entertainment. The Stage will heat up out on the patio! Music Entertainment of all genres - Feel Good Vibes with amazing people of the Peninsula! $5 Dollar Stoli Vodka Cocktails ALL DAY & ALL NIGHT! Doors Open at 2pm - Bring your Sun Block!